What was–or is–your favorite toy? The current issue of ID (International Design) magazine has an article in which famous designers describe their favorite toy. Most picked items from their childhood. The write-ups are priceless. Who knew that Paul Budnitz (Kidrobot founder) rode his Big Wheel until he was so big that he had to have his dad nail a plywood extension on the seat area? Or that Michael Bierut was into Matchbox cars? And John Maeda, author of “The Laws of Simplcity” and president of RISD, somewhat predictably picked Naef Toys. This got me pondering my own favorite toy: Jumbo Cardboard Blocks. 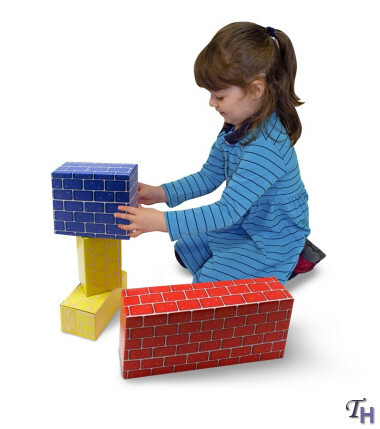 I first met these Jumbo Cardboard Blocks in Kindergarten. I was four, and like most of the kids in my neighborhood, I hadn’t been to preschool. It was a brave new world. I loved those blocks and I simply couldn’t believe our classroom had so many of them. Oh, the possibilities! I passed many happy hours making cities and castles and school rooms, where I tripped in and out of the “doors” directing imaginary citizenry. It was great, absorbing fun. But the real reason these blocks are my childhood favorite is they created a shining moment of childhood. It was the day my teacher “Mrs. Affleck” singled me out. I was surprised to recently learn that a fellow student hated Mrs. Affleck. I thought she was a dream, with a melodious voice, an old-fashioned (even then) brown bob, and a colorful array of slim, friendly-looking shirt-dresses. Children, just look at the wonderful creation Julie Knittel (my maiden name) and Roy Stufflebean made! They worked so nicely together. What a great job! So…I am asking what childhood toys might be the favorite for other people. No slightly sappy psychological dramas (like mine) need be attached. Sometimes Play-doh is just Play-doh. But it’s still great. Please pack your knives and go. Margaret….oh I love clay too. Sculpey is kind of miraculous in its ability to hold its shape and color through baking. It’s wonderful for making custom items to commemorate big events. (Like make a mini soccer shirt like the real one a kid wears, or a Christmas ornament with someone’s name on it, or a little tchotchke to sit on a desk) People think you are so talented when you do that! But back to the toy idea (what I am writing is starting to sound more like work than play…) you are so right about clay. You can’t get it wrong.